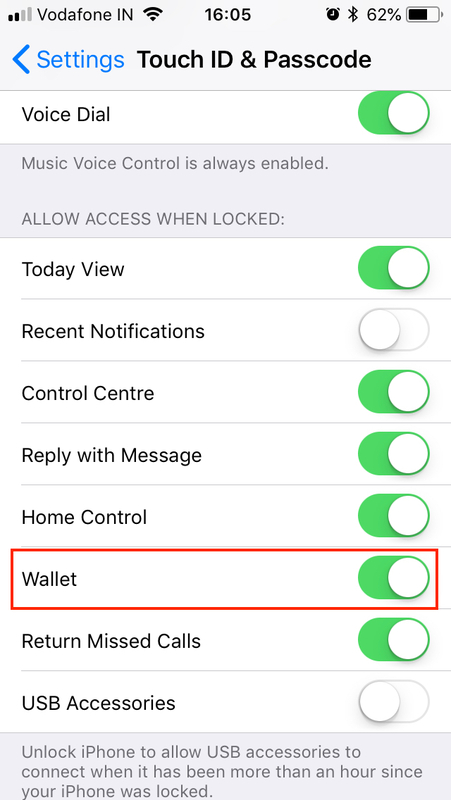 When using the Apple Wallet app shortcut from the lock screen (double press the home button to bring Wallet up), I noticed that it was possible to bring up the Wallet even when the device is locked. This means that any cards added to Apple Wallet can be seen even if the device is locked. Is it possible to either hide these cards or to prevent the shortcut from working, when the device is locked? This shortcut is very useful in situations when accessing the Wallet is necessary (and it's useful to be able to quickly get to all the passes), but I do not want anyone else to access my ID cards and/or travel information if they have access to my device while it's locked. Go to Setting app → Touch ID & Passcode. Scroll down to Allow Access When Locked section. Turn off the switch against Wallet. This will disable Wallet access when the device is locked. Not the answer you're looking for? Browse other questions tagged iphone ios wallet . Can I prevent SMS from showing on the Lock Screen in iOS 4? Can a thief know my Apple ID without my PIN code?